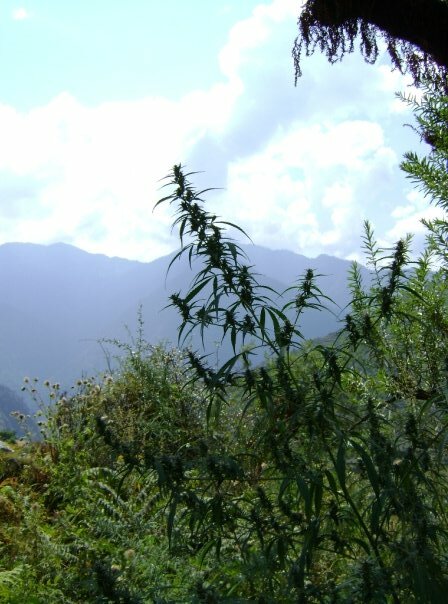 Although uncommon in the modern western world, it is not all that unusual to find the cannabis plant thriving in some untended corner of a lot, along country roadsides, or reaching for the sun in competition with other wild plants on a mountainside. 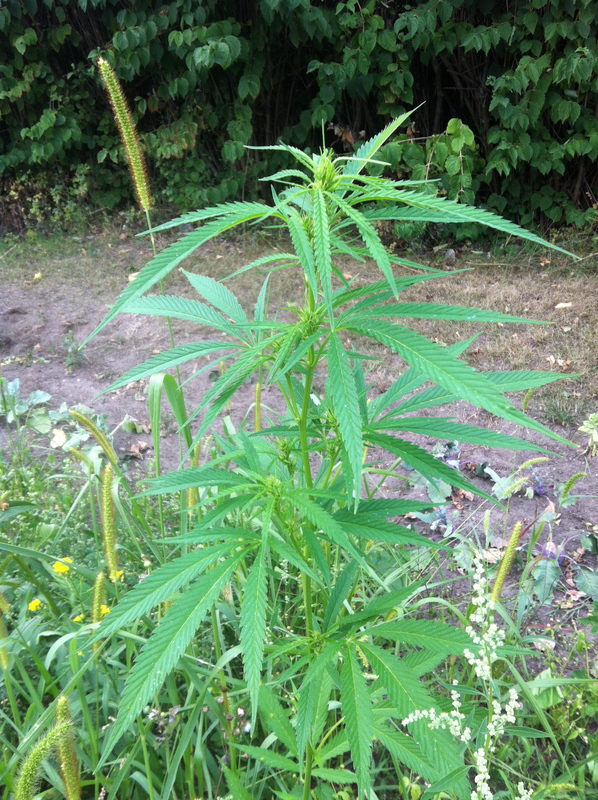 Hunting for wild marijuana (as well as a multitude of other useful wild herbs) is a favorite pastime of mine. Autumn is prime time (for those with keen eyes) to find cannabis plants in flower, or perhaps already gone to seed – which is a great opportunity add some C. ruderalis, or stray sativa genetics to your collection. Crossing a “wild” strain with a commercial plant is a great way to breed seeds that are suited to your climate. In the next growing season, take a pocketful with you on an afternoon walk and be the modern Johnny Appleseed; a guerilla gardener spreading the goodness around with the hope that this lovely plant will take hold amongst the local flora and become a permanent fixture. Keep your eyes peeled while out of doors this fall – you may be surprised where this wily plant will show up. I’ve also found wild plants growing along roadsides where new trees were planted. The seeds must have been in the mulch they spread in hopes of keeping “weeds” down. Ironic! I even found a beautiful little plant with purple-tinged buds growing among the yarrow and dandelions in front of a doughnut shop. Be prepared to look for a variety of leaf shapes and plant sizes. I’ve seen mature plants no taller than a dandelion (below) or taller than most basketball players (first image above). 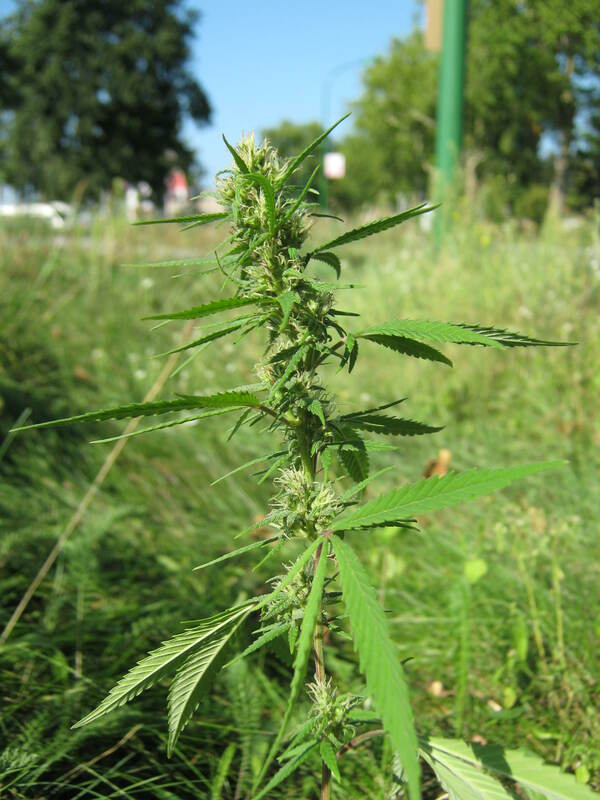 Google “cannabis leaves” and have a look – you may find long, thin sativa-like leaves, or broad, fat leaves that almost look like stinging nettle. Look for sunny spots where disturbed soil butts up against things man-made. Fallow lots, abandoned construction sites, and urban footpaths are prime territory. Don’t trespass 😉 Cannabis is a wily plant that can get by with little water and in poor soil. These plants may not produce a lot of bud, but the seeds are carrying ‘survivalist’ genetics you can use to cross-breed your own strains that are fit for guerilla gardening. 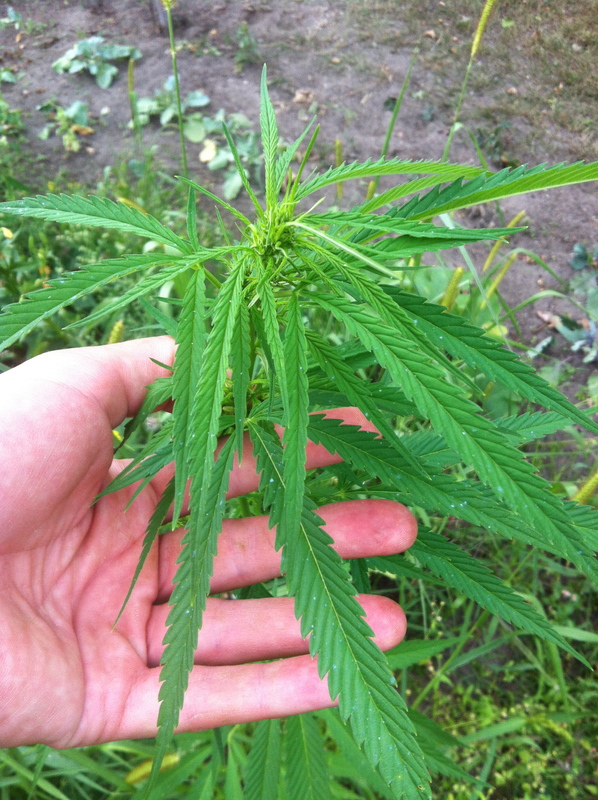 On the flip-side of the previous point, it’s unusual to find wild marijuana in rich, moist soil. Generally, faster growing plants that prefer the richer soil get a leg up, and keep cannabis from taking hold there. Respect the wild plant. 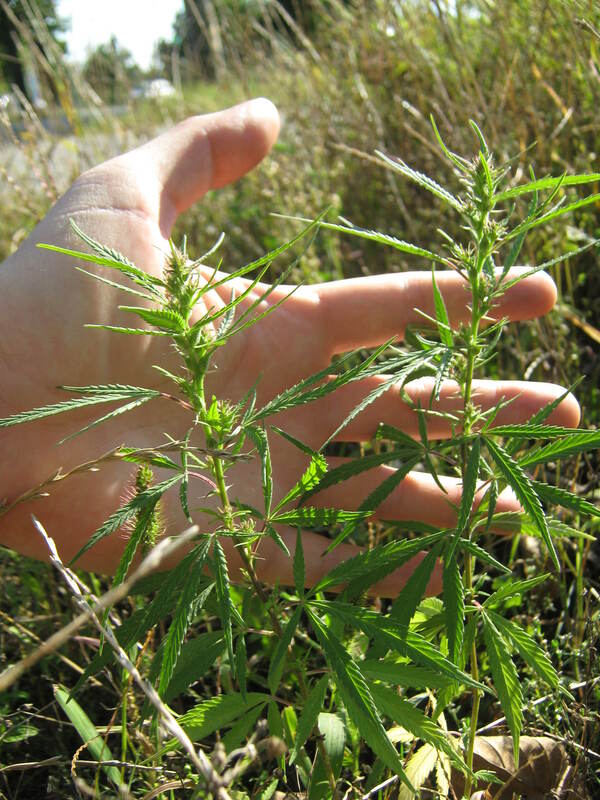 If you’ve ever cultivated marijuana, you’ll have respect for the long road to flowering – and the wild plant was also lucky enough not to be gobbled up by a deer, weed-wacked by a civil servant, or uprooted by a greedy forager. Pick only a small bud, or better yet, gather seeds. Take a few pictures – finding wild marijuana is fun and exciting! If there are a lot of seeds, consider spreading a few around in the area where similar growing conditions exist. Finally, be cautious of those who may actually be illegally cultivating! If you’re on a hike deep into the countryside and find several large, healthy plants, they are probably not wild plants. You run the chance up bumping into their large, healthy caretakers, who are probably not keen on foraging, picture-taking visitors. Please, if you do decide to “guerilla garden”, don’t put yourself at odds with the law. Know your local laws. Please respect public lands! Spreading a few C. ruderalis seeds that will take hold if conditions are right is a world of difference from, for example, illegally cultivating (digging, watering, fertilizing) in a park or preserve. Don’t do it. Encouraging the wild growth of this useful plant, however, is fine. It will provide food for a variety of birds and foraging animals, and who knows, perhaps a spliff for an enterprising racoon? Most important, remember the etiquette of the forager when searching for wild herbs – marijuana included: Never uproot plants, and be sure to leave plenty there so that there will be more next season! If you see a budding plant, take just a small bud (it’s likely not to be the greatest smoke anyway) and sample it with the same pleasure as you might when collecting wild raspberries. The forager’s motto is to leave at least 90% of what you find so the plant has a chance to come back again and again. Take seeds and spread them! In this way you’ll ensure that there’s even more in the next generation, and if you like what you sampled, that means more for you. Are you in the US or another country? I have been trying to get some c.ruderalis seeds, but no luck. Do you know where I can get some seeds (10 or so)? I’ve planted seeds around in the wild. And from my observations is that more stuff tends to grow around this plant. A lot of insects and animals also feed on this plant. Therefore keeping them away from other plants. So if you think that woods with weed will kill the forest that is an unintelligent opinion oriented guess. Hi Carlos, I’ve checked your website and contacted you, since there was no webshop availeble. I’d like to hear from you, thank you! Hi Carlos, I tried accessing your link and it was forbidden. Do you still experiment with Ruderalis strains? I have now foraged five different states with no luck whatsoever. After reading this and doing a little research I can’t believe the uses of this plant and how far it goes back. But even after extensive phone calls to Universitiesbotanical labs and gardens from the states to Japan to Australia.. To botanical societies, where I talked to some really brilliant people, to months of Internet digging.. I cannot find the plant or wild strain seeds. I won’t give up hope and I won’t stop my search, my work takes me all over the states but I need to ask, where do I get these seeds?? Wonderful articles, by the way!! Definitely following! I sent you an email in regards to the wild ruderalis seeds. I was wondering if you still have any left? May I have permission to use that next to last picture of yours with your hand behind lending emphasis to the plant just growing naturally in the soil there? I’m creating a presentation on medicinal/therapeutic benefits of cannabis for school and would like to use it. I will of course cite your name and website on my credits/acknowledgements page. Thanks!! Yes, that is fine with me. Please add a link to the ebook too, if you would!